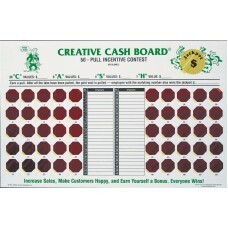 Sales Incentive Game Boards are a unique tool which can help increase team morale, promote up-selling, and boost sales at your auto dealer service department, auto body shop, or auto repair shop. Technicians and Mechanics are incentivized to complete desired actions with the reward of a pull from the board. Different companies use different incentives, however, a common target is to reward employees with a pull for every $100 worth of services they up-sell. Each pull on the board comes with a cash prize. 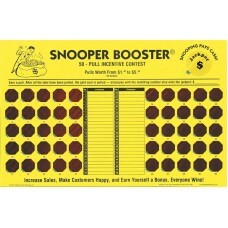 The Snooper Booster board has pre-determined cash prizes ranging $1-$5 and pays out a total of $85 plus the jackpot which is determined by the manager, whereas the Creative Cash Board pays out four amounts which are signified with the lettered C, A, S, H. When an employee pulls the tab, they are instructed to write their name or initials next to the tab number or on the numbers corresponding line. After all 50 tabs are pulled, the jackpot tab is pulled. Under the jackpot tab is a number. The employee whose number is listed under the jackpot tab wins an additional jackpot prize determined by the manager.